Helicoprion ("Spiral Saw") was a long-lived genus of shark-like cartilaginous fish that first arose in the oceans of the late Carboniferous 280 million years ago, survived the Permian-Triassic Extinction Event, and eventually went extinct during the early Triassic some 225 million years ago. The only fossils known are the teeth, which were arranged in a fantastic "tooth-whorl" strongly reminiscent of a circular saw. It was not until the discovery of the skull of a relative, Ornithoprion, that it was realized that the tooth-whorl was in the lower jaw. The tooth-whorl represented all of the teeth produced by that individual in the lower jaw, in that as the individual grew, with the older, smaller teeth being moved into the center of the whorl by the appearance of larger, newer teeth. 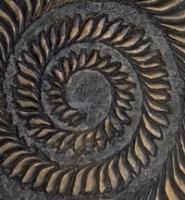 Comparisons with other eugenodontids suggest that Helicoprion may have grown up to 10-15 ft long. The individual teeth are serrated, and it's implied that Helicoprion was carnivorous. As there has yet to be an actual skull found, exactly how it captured or fed on its prey are subjected to a great deal of speculation. One hypothesis that it preyed on ammonites and that the teeth were specialized for the job of breaking into the ammonites' shells. Another idea was that the shark would swim into a school of fish and fling out the jaw, snagging prey on its many teeth. 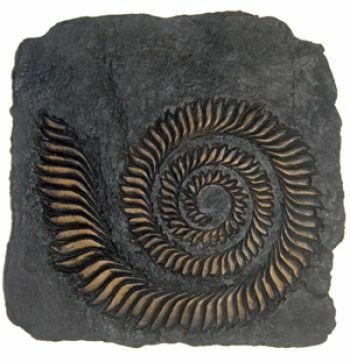 The most famous specimens of Helicoprion are found in eastern Idaho, northern Utah, and the far central western part of Wyoming.